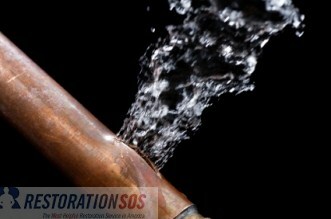 A burst pipe can create serious water damage to your home and belongings. As soon as you learn that you have a burst pipe at home, consider it an emergency and follow the steps below immediately to mitigate water damage. Shut off the main water supply by turning off the main stop tap, which is usually either in the area where the main service pipe connects to the home or under the kitchen sink. It is best to ensure that everyone in your family knows where the main stopcock is located and how to turn it off in case of a burst pipe emergency. Let the pipe drain out the water by turning on all cold taps. Switch off the water heating system and then turn on all hot taps to help in draining the water supply system. Also, flush all toilets. All leaks should stop once there is no more water running from the taps. Locating exactly where the pipe burst is should be done immediately to prevent further damage. Once you've found the burst, you'll know what you have to do next. For instance, if it�s a tiny crack, patching it up may fix the problem for a while. Also, consider which pipe has burst. If the damage is in a main water pipe, it needs to be repaired and dealt with carefully regardless of the cause or size of the break. If there has been leakage in the house for some time, be careful when entering rooms. Pay attention to the ceilings because if they appear to bulge, it means it is holding loads of water and could cave in any moment. If you've noticed the leak right away, place a bucket underneath to catch the drip. If there is flooding or water damage in the home, call a professional water damage restoration company to remove the water from your home and dry it out. Remember to turn off the main electrical supply unit immediately and never touch anything electrical if it's wet. When incidents like emergency water damage happens, it is best to contact your insurance company immediately to begin your homeowner�s insurance claim. Your insurance agent will advise you what steps you should take for your policy. He or she will certainly give you a visit to assess the damage. Documentation of the damage is very important and you can do this right away while waiting for the insurance agent if you have a digital camera or video camera at home. While it is easy to get professional help to fix a burst pipe and restore a water-damaged home, you should work towards preventing such damages to happen in your home in the first place. Preventing pipe bursts is not complicated at all. Take the time to learn about it and you�ll find out that preventive measures are way easier than repairing damaged pipes and a lot cheaper, too.